All holidays are available to start on any day of the week within the periods detailed, subject to availability. 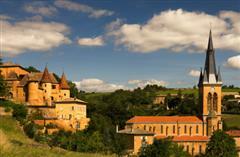 A Guided walking Holiday in the picturesque and relatively quiet southern Burgundy hills. Enjoy a large number of delightful historic sites (chateaux, villages, church, pre-historic sites) set in a pretty landscape of chardonnay vines, secluded valleys and rocky outcrops. A Guided walking holiday through the beautiful Beaujolais villages and countryside with the emphasis on discovering the different Beaujolais wine growing areas and trying the best at local vineyards. This moderate guided walking holiday takes a wonderful circuit around the southern part of the Beaujolais region, known for its pretty historic villages built from a warm golden limestone. Vines are ever present in this picturesque landscape. This moderate guided walking holiday explores not only the famous vineyards but also the little known regions of great beauty that lie beyond. Rolling hills and historic villages are in perfect harmony in this quiet French region where you'll have the paths all to yourselves. Discover the contrasting volcanic regions of the northern Auvergne in central France. 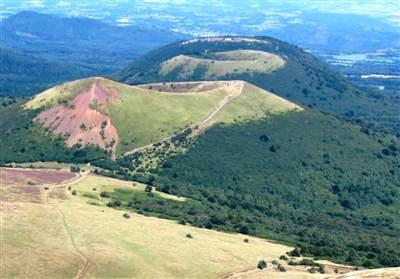 The Puy de Dome landscape varies from rugged peaks to open moorland and perfect volcanic cones. Dramatic waterfalls, varied lakes and pretty historic villages with fine roman churches all form part of this moderate week's guided walking. This guided holiday explores the Cantal massif in central France which is the extinct remains of a huge volcano. Erosion has since created a series of rugged ridges, rocky peaks and green valleys of stunning beauty. Exciting walking in an untamed lansdcape with rich wildlife. A Guided walking Holiday exploring the gorges, waterfalls, lakes and historic villages of Jura's picturesque wine region. Wine tasting and some of the prettiest villages in France are combined with some beautiful landscapes. This walking holiday explores a quiet unspoilt region where the Provence meet the Alps, which at the end of June is at a time when the lavender is in flower. Wonderful perched villages, beautiful landscapes bathed in an amazing light, great climate. 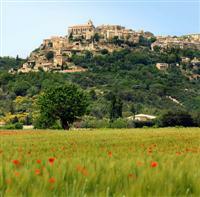 Our guided walking holiday in the Luberon takes in some of the best loved hill-top villages in Provence. Moderate walking lets you discover a pretty landscape of vines, lavender, orchards and forests where small hills provide generous vantage points. You'll explore the beautiful historic villages of Gordes, Lacoste, Bonnieux, St Saturnin and Rousillon. Despite the popularity of the region, your holiday explores quiet trails inbetween the villages where each step is infused with the small of Provence herbs. At the end of each day relax by the pool and soak up the Provence sunshine at your delightful accommodation. A guided week's walking that explores medieval hilltop towns and the valleys that cut through the landscape giving it a distinctive character of deep rocky gorges, steep wooded valleys and high sunny plateaux. Discover the French Alps under its winter blanket of snow. Based in a wonderful 3-star hotel in Arvieux, our snow shoeing holiday will allow you to discover the most beautiful landscapes of the Queyras, as well as discovering a region full of unique traditions and architecture. Each day your guide will take you to a different valley in the Queyras Regional Park. 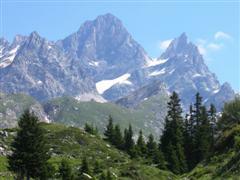 A spectacular relatively undiscovered alpine region of rich contrasts. 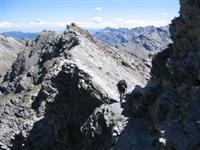 Deep gorges, alpine meadows, rocky deserts and rugged mountain ridges and peaks. Accessible high mountain passes and summits, and a sunny climate makes this an ideal destination for an alpine walking holiday. A magical place where gleaming rock faces meet wild and desolate plateaux. 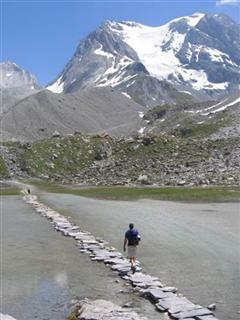 Discover amazing natural wonders on a guided walking holiday in this often overlooked corner of the French Alps. A guided week's walking that explores a the dramatic alpine landscapes of the Vanoise National Park, where glacier topped mountains overlook beautiful valleys carpeted with alpine flowers. The tour of the Vanoise is a circular trek which allows you to be at close quarters with elegant high mountain peaks and stunning alpine glaciers. Designated a National Park, the Vanoise offers an ideal natural, unspoilt wilderness for trekking holidays where souring alpine peaks with pristine glaciers rise majestically above wild, remote valleys. This exhilarating and challenging guided trekking holiday near Mont Viso on the French, Italian border takes in five alpine peaks above 3000m. Exploring part of the Queyras region of the Alps you'll pass through unspoilt mountainous terrain, in an area with 300 days of sunshine a year! The Picos de Europa are a majestic range of limestone mountains in the north of Spain rising abruptly from the Atlantic coast. They are characterised by steep-sided valleys, huge towering cliffs, isolated pretty villages and rugged summits. Starting in the beautiful valley of Ait Bouguemez, your trekking holiday goes to the summit of M'goun, taking in vast panoramic views of the valleys and the Central High Atlas. Passing through the Wandras gorges and the high plateaus, this is a trek of amazing contrasts. Less popular with trekkers than Toubkal, and arguably more beautiful, this is a true wilderness experience not to be missed. Our guided trek goes to the huge sand dunes of the L'oued Drâa, an environment which contains memories of the centuries of human endurance needed to cross this link between South and North. Experience the immense solitude of the desert, and see the incredible clarity of the stars and constellations which light up the nights. 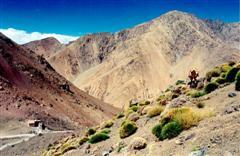 A rich and colourful experience summiting Toubkal, the highest peak in the High Atlas. Its stunning summit rises 4,167m providing exciting and challenging walking, as well as fantastic views. Most of the above guided walking holidays can be arranged to start on any day of week within the periods detailed, subject to availability. The price of the holiday is dependent on the number of people in your party and prices are given as a guide to probable costs. Please contact us if you would like further information or a price for your group. We occasionally have fixed date walking holidays which we run and advertise on an adhoc basis. These will be detailed on the relevant holiday page and announced through our news page and social media.